It seems like one of the basic tenets of the American identity that’s been defined in the past few centuries is that we help people in need. It’s what we do. Sometimes it may completely backfire and sometimes we may have some ulterior motives, but that’s who we are and who we always have been. But what happens when we…can’t. With FEMA’s disaster-relief fund looking to be dangerously low, that appears to be the problem. Recently, House Majority Leader Eric Cantor took it upon himself to be the bad guy in this story, proposing that any additional funds (like those for Hurricane Irene) should be offset by set spending cuts. 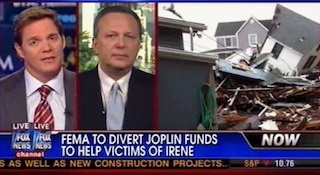 Unsurprisingly, this hasn’t been an entirely popular notion, however, there’s at least one guy who agrees with him; former FEMA administrator Mike Brown who discussed the proposal today on Fox News. After discussing that fun subject, the conversation moved to the perceived “over-hyping” of Irene. Brown said he felt the officials did everything right in preparing the populace. His only change would have been letting people know sooner when the storm was downgraded. However, he still understands why they did what they did.